The Fly Agaric or Fly Amanita mushroom is a poisonous and psychoactive fungus. 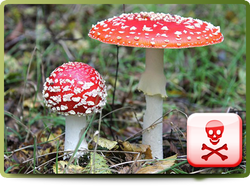 Fully grown, the cap can grow from 8 to 20 centimeters in diameter and is bright red in colour. The white markings on the surface of the cap are from the universal veil that it breaks through as it starts growing. The gills and spore print are white. The stipe is white and can grow from 5 to 20 centimeters tall and 1 to 2 centimeters in diameter. The stipe, at its base, bears a universal veil that is distinctive to this mushroom.